Shao Lin Pagoda (Shaolin Pagoda, a Temple Known All Over the World) is located in Song Shan, Henan Province, China. It was established in 495 AD by a monk Boddhidharma, the 28th Patriarch of Buddhism and the first patriarch of Ch'an Buddhism (more famously known as Zen.) It was in the sixth century that Ta Mo, known as Bodhidharma in India , crossed the Himalayas and taught the Shao-Lin monks static meditation called Chan or Zen, breathing techniques and exercises. The temple is also the legendary home of the Shao Lin Wushu (Kung Fu/Martial Arts) that is still being practice on the grounds of the temple. 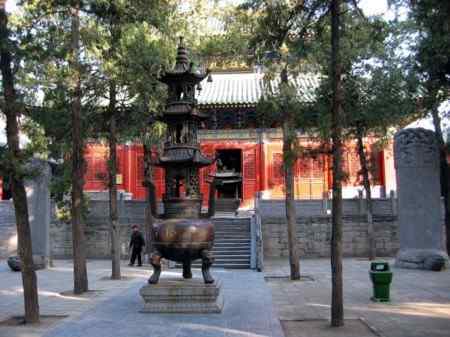 Situated about 300 meters to the west of the Shaolin Pagoda is the Pagoda Forest, in which over 240 pagodas in different styles erected from the Tang, Song, Jin, Yuan, Ming and Qing Dynasties.